Detritus includes all forms of nonliving organic carbon (C) including fallen leaves, the waste products and carcasses of animals, fragments of organic material of unknown origin, and organic compounds. Originally restricted to particulate matter, it now is considered to include dissolved organic matter (DOM) as well (Wetzel 2001). Nonliving organic C from diverse sources provides important energy inputs to most food webs, and this is especially true in fluvial ecosystems. 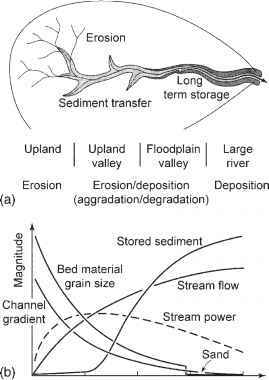 While primary production by the autotrophs of running waters can be substantial (Chapter 6), much of the energy that supports fluvial food webs derives from particulate detritus and DOM. These energy pathways are referred to as detrital or detritus-based, and the immediate consumers of this material are decomposers and detritivores. Plant litter and other coarse debris that falls or blows into stream channels, fine particulates that originate from many sources including the breakdown of plant litter, and DOM constitute the three main categories of nonliving OM in most situations (Table 7.1). Some of this material originates within the stream, such as dying macrophytes, animal feces, and extracellular release of dissolved compounds, and some is transported into the stream from outside the channel, such as leaf fall, soil particulates, and compounds dissolved in soil water. Collectively these sources can substantially exceed the energy fixed within streams by photosynthesis. The division of nonliving organic energy sources into size classes is widely employed in studying detrital dynamics in streams. The usual categories are coarse particulate OM (CPOM, >1 mm), fine particulate OM (FPOM, <1 mm and >0.5 |im), and DOM (<0.5 |im). Each category can be divided further, but the dividing lines are arbitrary. In some instances, particularly the breakdown of forest leaves that enter streams, we have a detailed understanding of the processes involved. In other instances, such as the pathways involving fine particulates, we know considerably less. However, it is clear that the dynamics of OM in streams are complex, microorganisms are critical mediators of OM processing, and the surrounding landscape significantly influences what takes place within the stream.